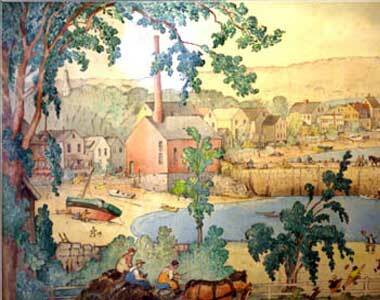 Artist Harrison Cady first visited Rockport in 1896, and later settled here as a perennial summer resident. Painting the view from the porch of his Atlantic Avenue home in 1938, Cady created an amazing triptych of Rockport Harbor, a part of which is shown here. Highlighting the working lobster boats, happy tourists and a beautiful summer’s day, Cady added his own whimsical interpretation to the local scene.